batsmen and the wicket-keeper are wearing protective gear including safety helmets, padded gloves and leg guards. While the umpire stands at the bowler’s end of the pitch, his colleague stands in the outfield, usually in or near the fielding position called “square leg”, so that he is in line with the popping crease at the striker’s end of the pitch. 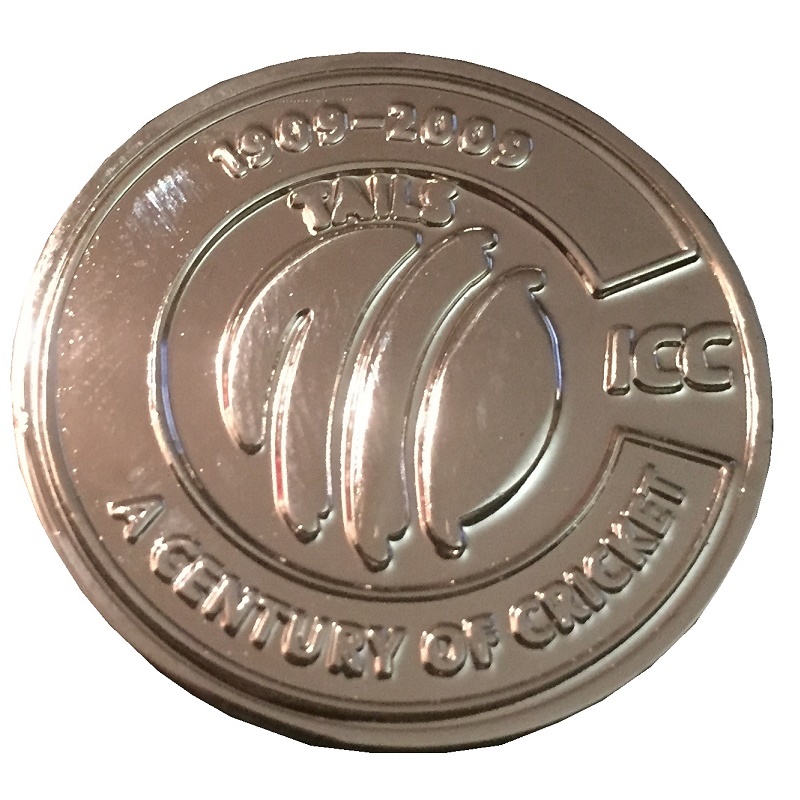 The bowling crease is the one on which the wicket is located between the return creases. The bowler intends to hit the wicket with the ball or, at least, to prevent the striker from scoring runs. The striker intends, by using his bat, to defend his wicket and, if possible, to hit the ball away from the pitch in order to score runs. Some players are skilled in both batting and bowling so are termed all-rounders. Bowlers are also classified according to their style, generally as fast bowlers, medium pace seam bowlers or, spinners. Batsmen are classified according to whether they are right-handed or left-handed. If a fielder is injured or becomes ill during a match, a substitute is allowed to field instead of him, but the substitute cannot bowl or act as a captain. The substitute leaves the field when the injured player is fit to return. 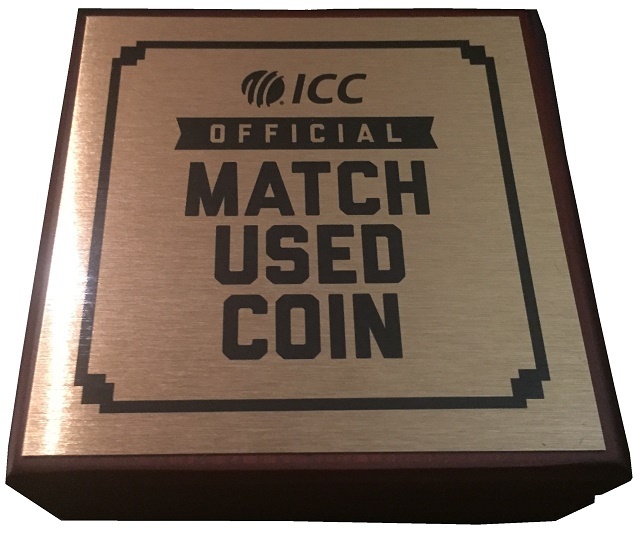 The Laws of Cricket were updated in 2017 to allow substitutes to act as wicket-keepers, a situation that first occurred when Mumbai Indians’ wicket-keeper Ishan Kishan was injured in a match on 18 April 2018. A bowler reaches his delivery stride by means of a “run-up” and an over is deemed to have begun when the bowler starts his run up for the first delivery of that over, the ball then being “in play”. Fast bowlers, needing momentum, take a lengthy run up while bowlers with a slow delivery take no more than a couple of steps before bowling. The fastest bowlers can deliver the ball at a speed of over 90 mph and they sometimes rely on sheer speed to try and defeat the batsman, who is forced to react very quickly. Other fast bowlers rely on a mixture of speed and guile by making the ball seam or swing (i.e. curve) in flight. This type of delivery can deceive a batsman into miscuing his shot, for example so that the ball just touches the edge of the bat and can then be “caught behind” by the wicket-keeper or a slip fielder. At the other end of the bowling scale is the spin bowler who bowls at a relatively slow pace and relies entirely on guile to deceive the batsman. A spinner will often “buy his wicket” by “tossing one up” (in a slower, steeper parabolic path) to lure the batsman into making a poor shot. The batsman has to be very wary of such deliveries as they are often “flighted” or spun so that the ball will not behave quite as he expects and he could be “trapped” into getting himself out. In between the pacemen and the spinners are the medium paced seamers who rely on persistent accuracy to try and contain the rate of scoring and wear down the batsman’s concentration. There are ten ways in which a batsman can be dismissed: five relatively common and five extremely rare. The common forms of dismissal are bowled, caught, leg before wicket (lbw), run out and stumped. Rare methods are hit wicket, hit the ball twice, obstructing the field, handled the ball and timed out. The Laws state that the fielding team, usually the bowler in practice, must appeal for a dismissal before the umpire can give his decision. If the batsman is out, the umpire raises a forefinger and says “Out!”; otherwise, he will shake his head and say “Not out”. There is, effectively, an eleventh method of dismissal, retired out, which is not an on-field dismissal as such but rather a retrospective one for which no fielder is credited. Batsmen take turns to bat via a batting order which is decided beforehand by the team captain and presented to the umpires, though the order remains flexible, when the captain officially nominates the team. Substitute batsmen are not allowed. A skilled batsman can use a wide array of “shots” or “strokes” in both defensive and attacking mode. The idea is to hit the ball to best effect with the flat surface of the bat’s blade. If the ball touches the side of the bat it is called an “edge”. The batsman does not have to play a shot and can allow the ball to go through to the wicketkeeper. Equally, he does not have to attempt a run when he hits the ball with his bat. Batsmen do not always seek to hit the ball as hard as possible, and a good player can score runs just by making a deft stroke with a turn of the wrists or by simply “blocking” the ball but directing it away from fielders so that he has time to take a run. A wide variety of shots are played, the batsman’s repertoire including strokes named according to the style of swing and the direction aimed: e.g., “cut”, “drive”, “hook”, “pull”. The batsman on strike (i.e. the “striker”) must prevent the ball hitting the wicket, and try to score runs by hitting the ball with his bat so that he and his partner have time to run from one end of the pitch to the other before the fielding side can return the ball. To register a run, both runners must touch the ground behind the crease with either their bats or their bodies (the batsmen carry their bats as they run). Each completed run increments the score of both the team and the striker. 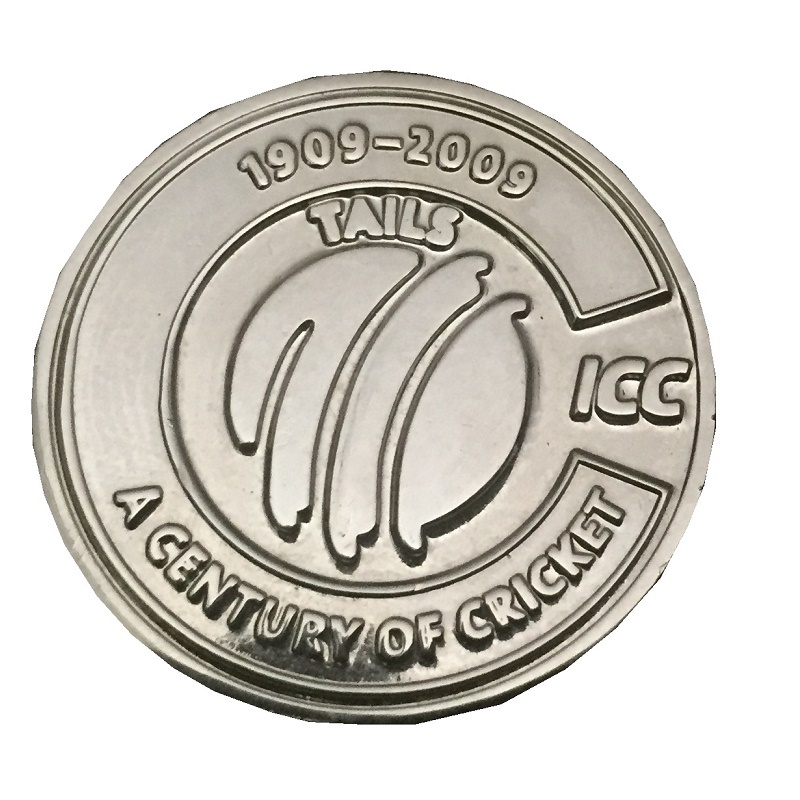 One form of cricket is Twenty20 cricket, aka Twenty-20, and abbreviated to T20. 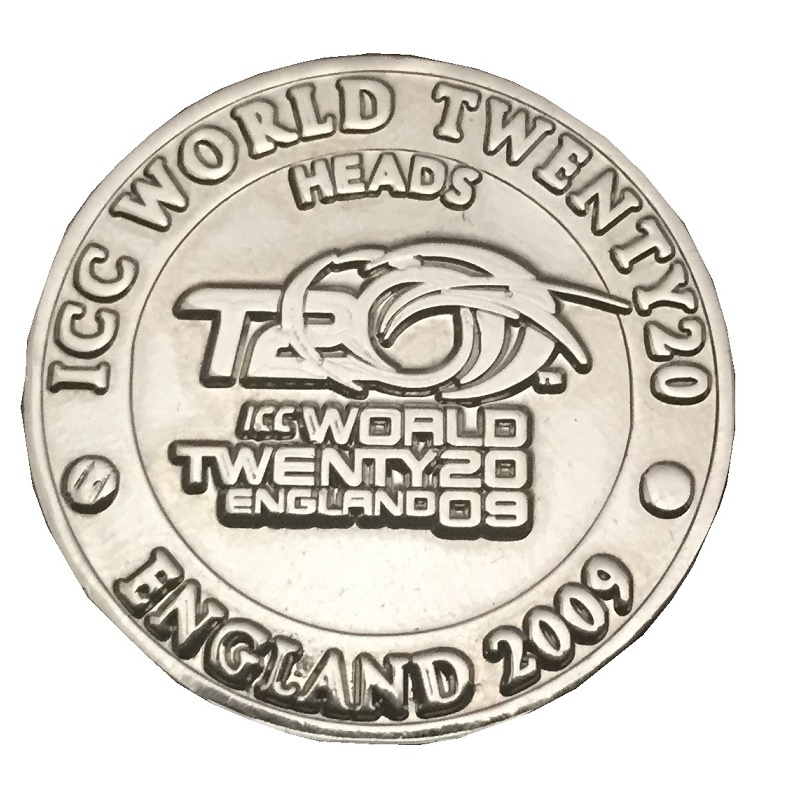 In a Twenty20 game the two teams have a single innings each, which is restricted to a maximum of 20 overs. 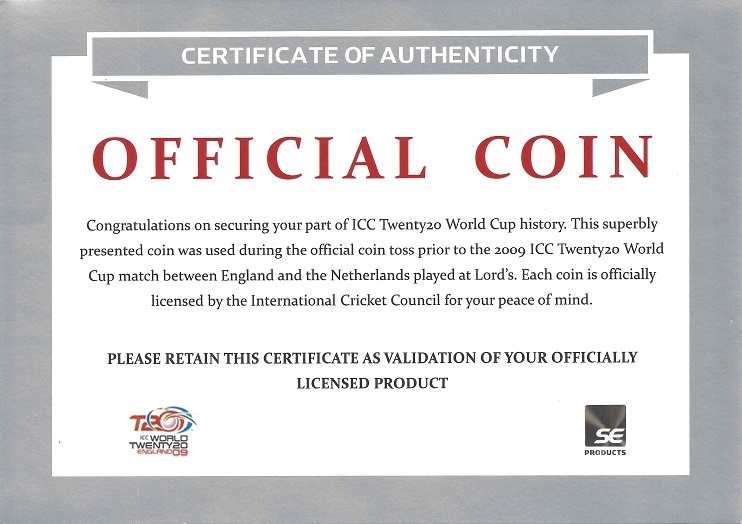 The England and Wales Cricket Board created Twenty20 in 2002, and it has grown in popularity, spawning its own World Cup, like the ones played in 2009. 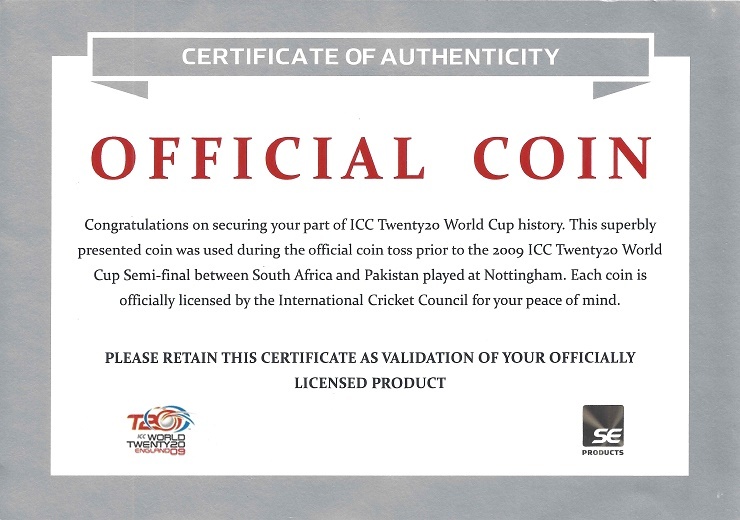 I have a couple of match-used coins from the 2009 Twenty20 World Cup, including this one, from the South Africa vs. Pakistan semi-final, where Pakistan won with 149/4 over South Africa’s 142/5. 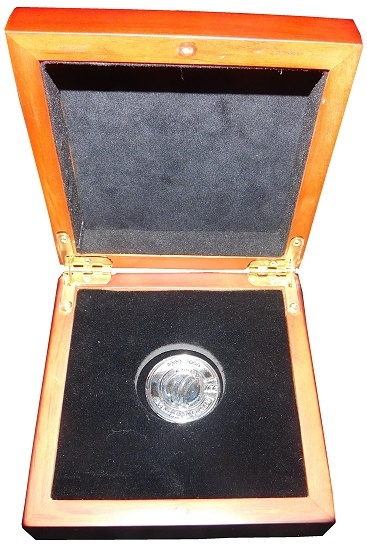 The coin, slightly larger than an American quarter, is in great condition. 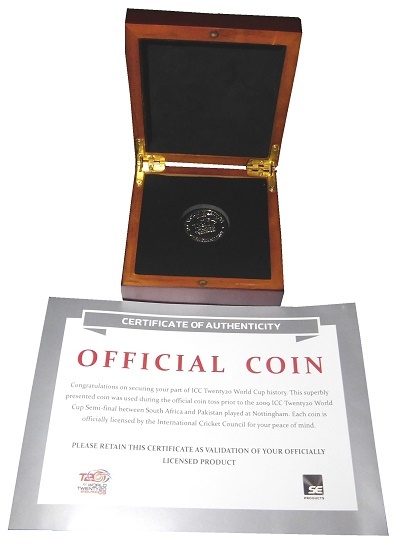 The specially made coin is not sold as a replica, and comes in a customized box, with an International Cricket Council logo. 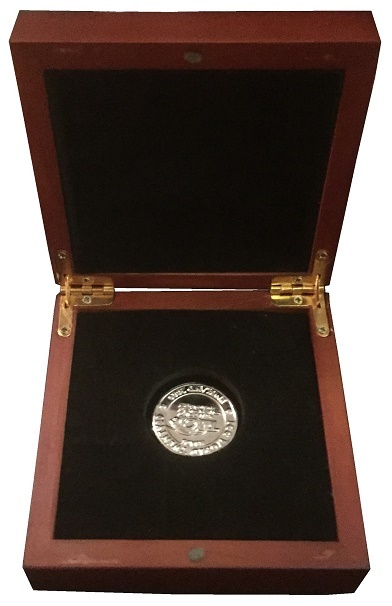 The box is about 4 inches square. 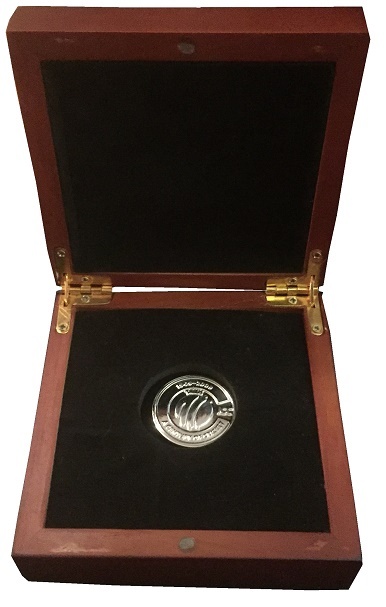 The coin itself is slightly larger than an American quarter, though much smaller than an NFL toss coin. The heads and tails are marked. 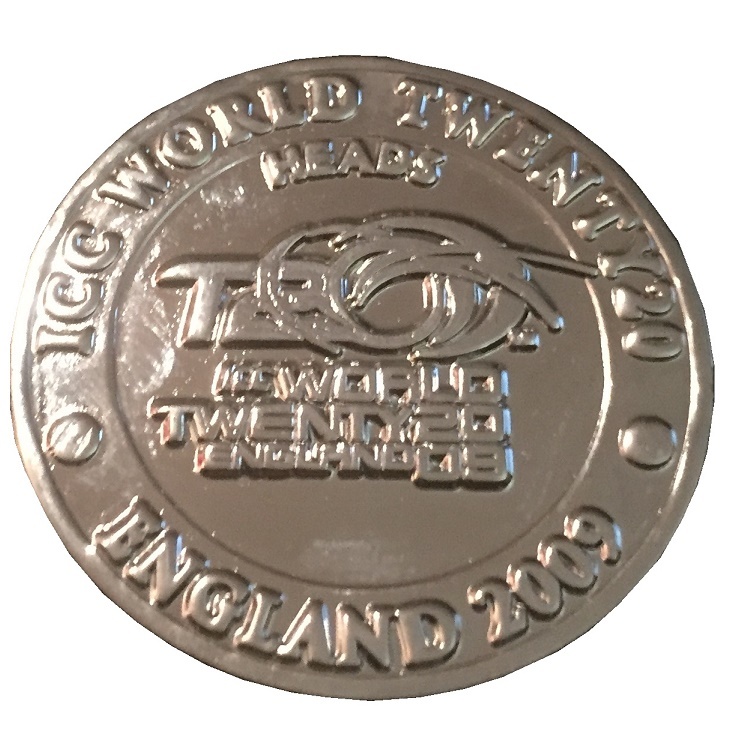 The heads side features a 2009 ICC Twenty20 logo, with England 2009. 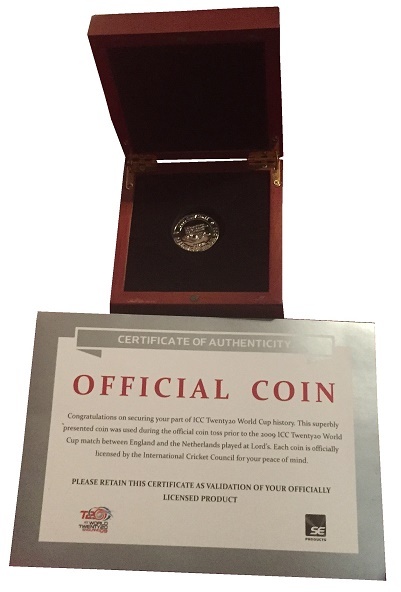 The tails section features an ICC logo, with a 100th anniversary commemoration. 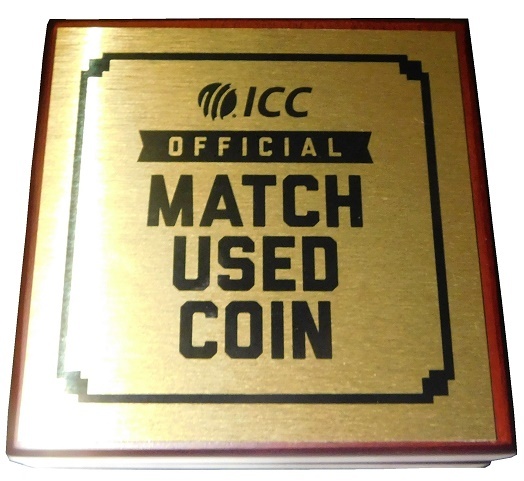 The coin comes with an ICC COA. 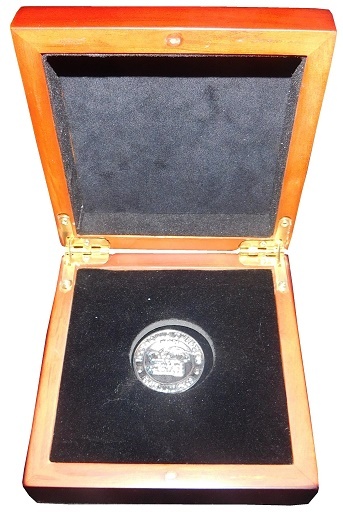 I also have a second coin, from a Group B competition between England and the Netherlands. This was one of the early matches, where The Netherlands won 163/6 over England’s 162/5. 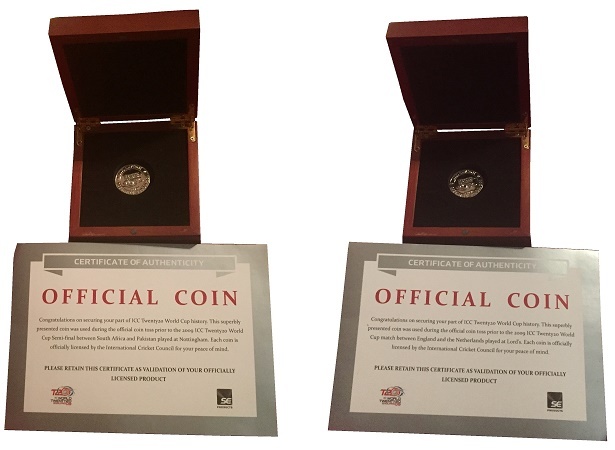 The coin is identical, no serial numbers are on these coins, and the only difference is the COA. Next week, I resume the vest project.